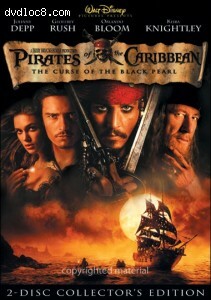 This page contains easter eggs for the disc Pirates Of The Caribbean: The Curse Of The Black Pearl (DVD, Region 1). On disc 2, under Below Deck, highlight the skull on the left side to see some 3D Animation of scenes. It's not as good as some of the other easter eggs, but worth taking a quick look at. On disc 2, go to "Below the Deck" and select "Scene Index." Go to the "Next" screen and highlight the ring on the skeletal hand. You'll see the Japanese teaser trailer. On disc 2, go to the 'Moonlight Serenade - Scene Progression'. Press right and a tooth on the Pirate should be highlighted. You will then see a short interview with Keith Richards. On disc 2, go to "Fly on the Set", then click right to highlight one of the monkey's canine teeth, click enter and you will see a fast forward progression of how the cave set was built. On disc 2, go to "Below the Deck", click left to highlight the coin, click enter and you'll see the animatics for the entire chase and fight sequence between the Black Pearl and Intercepter. It's quite long, and it's scored. Load disc 2, and go to 'fly on the set'. Make sure 'play all' is highlighted, then press the right arrow twice. The pirates tooth should light up. Press play and enjoy 'pirates cave construction'.